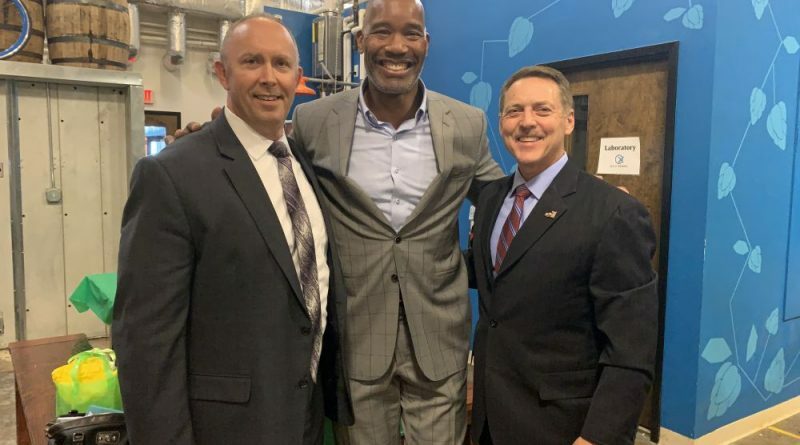 Loudoun Sheriff Michael Chapman kicked off his reelection campaign with a party Thursday, April 11 at Old Ox Brewery, featuring actors from the movie “Police Academy” Bruce Mahler and Marion Ramsey, and former Washington Redskin and four-time Pro Bowler Charles Mann. Chapman was first elected in 2011 and reelected in 2015. He is seeking a third four-year term. During the event, Chapman pointed to Loudoun’s falling crime rate overall—a 19 percent drop since he took office—and that it has one of the lowest crime rates in the DC metro area. He also pointed to studies from the University of Virginia that show Loudouners give the Sheriff’s Office approval ratings at 90 percent or better in most categories. In 2017, the Loudoun County Sheriff’s Office was the first in the state buy a drone equipped with Project Lifesaver technology. That nearly $100,000 drone also comes equipped with infrared detection and camera equipment. Shortly after Chapman took office, the first Crisis Intervention Team training happened in Loudoun, and Chapman has presided over the program’s growth. It trains officers to handle a wide range of mental disabilities—from autism, to veterans suffering from post-traumatic stress disorder or a traumatic brain injury, to even coping with law enforcement officers’ own mental well-being and how to help a fellow officer contemplating suicide. As of December 2017, all Loudoun County deputies with at least two years of service had completed the CIT program. Concurrent with the CIT program, deputies’ use of Tasers dropped precipitously. Prior to the program’s inception, Loudoun deputies used their Tasers 43 times. Today, the sheriff’s office averages four or less Taser deployments per year. The CIT program has also now been expanded to fire-rescue and private sector personnel in the region, and has received local and statewide recognition. Loudoun is also the first full-service sheriff’s office in the state to issue Narcan, an emergency opioid overdose medication, to all of its deputies. Loudoun has seen a reduction in opioid overdoses and overdose deaths while many other jurisdictions saw their numbers continue to grow. This year, Chapman was elected to the Major County Sheriffs of America’s Executive Board as the vice president for Homeland Security, and appointed co-chairman of Homeland Security for the National Sheriffs’ Association. “None of this happens by accident,” Chapman said, adding he “could not be prouder” of the sheriff’s office. Clerk of the Circuit Court Gary Clemens was the event’s master of ceremonies. Chapman will face the winner of the Democratic primary race between one of his own former senior officers, Chris Harmison, and Army Reserve intelligence officer Captain Justin Hannah. For more information, go to reelectsheriffchapman.com. The CIT program started under Sheriff Simpson. This is another example of Chapman’s propaganda and misinformation. When the head CIT trainer retired from the Sheriff’s Office after 25 years of service, she made the egregious mistake of personally thanking Sheriff Simpson for implementing the CIT program at her retirement luncheon. Chapman stormed out of the luncheon and then made calls to the Northern Virginia Criminal Justice Academy (NVCJA) to block her from getting a job as CIT trainer to recruits; a position she had been slated to start right after her retirement from LCSO. Again, another example of what a petty person Chapman is. Mambo- You are SO WRONG! The CIT concept was first used in the U.S. about 20 years ago in Tennessee. I know, I did law enforcement training in Loudoun and throughout the south. It wasn’t until Sheriff Chapman was first elected that the CIT program was established by the sheriff’s department in here in Loudoun!! The fact is former Sheriff Simpson NEVER initiated CIT. He knew about it, had 15 years to establish it, but did absolutely nothing about it. The most basic research would clearly show this to be true. And the other fallacy you mention about the former retired deputy CIT trainer is just that; totally wrong. The CIT instructor position at the academy to train recruits is done by a sheriff’s department deputy not by a contract position that the retired CIT instructor was seeking. Very simply there was no position to be had-or “blocked” as you claim. Mambo, check your facts-you are so very mistaken. Chapman lies about everything. He’s only out for himself. How come the newspapers and citizens are not requesting simple information like staffing levels, or lack of, how may positions are vacant because they can’t be filled because no one wants to put up with Chapmans crap. How about the people he surrounds himself with? Is that how he gets his friends, just waits at the jail doors for people to get released? With his associates around him getting locked up, do you not think that chapman isn’t involved in all these scams somehow? Wake up loudoun, time for a REAL sheriff and not a trouble making lying want to be.